Take a step back in time and experience Lake Tahoe as it once was! This quintessential old-Tahoe estate is extremely private and is steeped in charm and history. Note: The cabin style is modeled after old Lake Tahoe homes which were known for their rustic charm and wood cabin feel. A true Old Tahoe lake front home situated in a serene neighborhood. Two stone crafted fireplaces create a warm and inviting setting for your gathering. The living room has a grand piano for the music enthusiast while lake views from the dining room will add to the experience. Rustic and comfortable; this lakefront estate will accommodate your perfect family/business getaway! Five bedrooms in the main house and guest bunkhouse will accommodate up to 15 people. 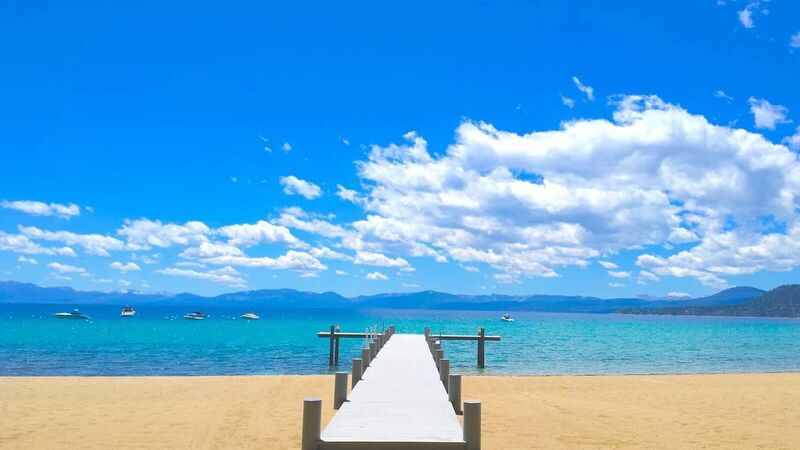 Stroll down to the private sandy beach or lounge on the grassy grounds and take in the beauty of Lake Tahoe. Please note that only 12 guests can access the beach at any time during peak summer months, no other visitors or friends outside of the renting party may use the beach. Guests can only use the beach area to the left of the pier as the beach to the right of the pier is private property belonging to the neighbor. No other outside guest may use the beach and there are penalties if you allow other people other than your guest group to access the beach through the Twin Top property. The landscaped yard has room for games of croquet and bocci ball. Enjoy kayaking, swimming, and boating right from the private dock. Mt. Rose and Diamond Peak ski areas are just minutes away as well as the Hyatt casino,boutique shops, and fine dining restaurants. Enjoy a round of championship golf or take a ride down the bike path along beautiful Lakeshore Drive. There are plenty of easily accessible activities for the entire family! Bedroom 3 - Bunk bed (2 twins), TV, VCR, and mini-fridge! Grassy, landscaped grounds are very private! There are 2 canoes for guests' use. Stroll the wooded path directly to the large, sandy beach and private pier. From the beach, you can't see the house or grounds at all! - Private beach and pier! Bring your boat! This home has a private buoy and plenty of parking! Please also know that there are no IVGID passes available with this property. There is a buoy that comes with this rental on Lake Tahoe. There are canoes available for guests use as well. We loved our week here! Amazing location and beach access, lovely "Old Tahoe" style property. Lots of knotty pine in a well loved home. Small enough to all be together, large enough for privacy. 7 adults, 4 teenagers, 3 kids in grammar/middle school. Property was safe enough for smaller kids to roam on their own, and close enough to other activities for the teenagers to safely drive. The only downside was lots of nearby construction and the attending noise, but that should be over soon. We could not have loved it more. We had a large party and everyone had plenty of space to sleep and there was a lot of room, both inside and out, to gather for family dinners and games!! The lake and beach were breathtaking and used often and happily!! The hot tub was such a plus. The area great for restaurants and activities if you want to explore. We would come again over and over. We came in a big group (15) but didn't feel crowd at all. The spacious living room and two separate dining tables make it so easy to have kids at one table and grown up at another. The house provides lots of utensils as well. Everything works fine. (saw a previous review mentioned something not working, it probably all got fixed by the time we arrived.) The lake view is lovely. Great to have a beach that you can step into at any time. We all love this house! So glad you guys had a great time at Twin Top. Yes it's pretty special. I'll be sure to pass this along to the owners. We hope you come again! Great property, but there were too many things broken in the house when we got there, ask Scott. It was a great time with the family and the property and location is awesome. It would have been better if the broken items were working when we got there, the leak under the kitchen sink, the broken hallway shower head needing replacement, the stereo that did not work at first, and some of the chairs were broken. I think for the price paid, all of those items should have been in good working order. The property is old, but that is part of its charm, provided it is in good working order. Thank you for this review. We are working with the owner to address those items. Yes the property is what is called "Old Tahoe" meaning it is an older cabin style home. The best thing about the property though is its beach location which is a rare find. There are few vacation rentals with access to the white sand beaches of Tahoe's east shore. Wish we could have stayed for longer. An unbelievable property. Friendly community. Must do. Lush, enchanting property with towering pines shading green lawns rolling down to the beach. Plenty of privacy to be found, even with a house full. Big property with a hidden sunken lawn and stone bench, several well placed benches, a deck and patio. Especially loved the peaceful mornings on the front porch with my coffee overlooking the lake. The patio was great for BBQ's, protected from an afternoon breeze, with ping pong and the jacuzzi. The swing was a huge hit with the kids. Being able to easily walk back and forth to the beach was very convenient. The sandy beach was a welcome treat, certainly more inviting than the usual rocky shoreline. Daily swims out to the float and canoeing were popular activities. Beach toys, rafts, chairs and umbrellas made it easy for us. The house was original "Old Tahoe", steeped in history with two big beautiful stone fireplaces, knotty pine paneling with beams and high ceilings. Very relaxed and comfortable. The bedrooms were a comfortable size and seemed to be located in different wings of the house which we liked. The kitchen was very well stocked, plenty of everything we needed, even the spice rack was full. A closet full of assorted classic board games was enjoyed in the evenings. The paperback trading library was handy when i finished my book and needed a new one to take to the beach. Our stay was magical. We will be back! From I-80: Take exit 188B for CA-89 & CA-267 toward Sierraville/Lake Tahoe. Turn right at CA-267 (Glenn Carlson Memorial Bypass.) Travel for 11.6 miles (past Northstar Ski area and over Brockway Summit.) At the traffic light in Kings Beach ("T"-intersection)turn left onto CA-28 and travel for 1.7 miles into Nevada. Continue on NV-28 for 2.3 miles and turn right onto Lakeshore Drive. Travel for 2.8 miles and turn right onto Pine Cone Circle. Your house is on the right (lakeside) and is #1615, use second buoy out on the far left row. For Beach use please use the beach which is to the left of the pier only. Beach to the right side of the pier is private. This is very important! Thank you.